Some of the amazing heroines of the faith are quite famous and you've heard of them; others may be new to you. But may we all be inspired by these women's selfless lives and their willingness to respond to God's call, doing the best they could in any circumstance they found themselves in! 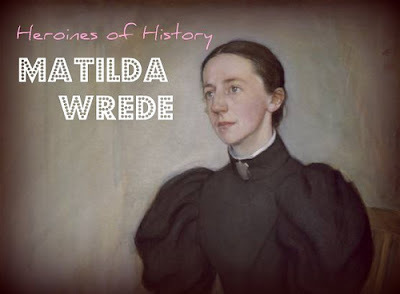 Today's woman is Matilda Wrede: a young woman of conviction. Born in 1864 into a life of privilege, Matilda was a Baroness in Finland. Although her mother died before Matilda's first birthday, there was such an age span over the nine children that Matilda's older sister, Helena, became Matilda's second mother at seventeen, and never married. In honor of the long, sunny days and your requests for more book recommendations, we thought that today instead of conversations we'd suggest a few to add to your list! A memoir of one girl's search to find God and love Him more deeply - and find her delight and life's sweetness in him. Can giving thanks for little things really change our lives? Our faith? Yes. It can. This is a beautiful little book. The writing is a bit cluttered sometimes, but it's a very readable and enjoyable book. This Gospel primer is exactly what the title says - a little book overflowing with Scriptural gems on how to live the Gospel each day. A definite must-read! Carolyn Mahaney, from GirlTalk, posted a thought-provoking article titled "The Secret of Fulfillment". She writes, "Our culture is constantly telling us to find our life; that we’re the center of our world, and as such, we need to take care of “me” first. But when I’m the center of my world, my world becomes very small—because I’m the only person in it. When I try to find fulfillment in anything besides loving Christ and serving Him, I will only end up more frustrated and completely unfulfilled." To continue reading the rest, click here. What do you think of when you hear the word "grateful" (as several of you referred to in leper lady's story)? How could we, as followers of Jesus, exemplify gratitude more in our lives? Quotations: What if Your Blessings Come Through Raindrops? Rather than posting a quote this week, we thought this beautiful song corresponded well with yesterday's topic and wanted to share! I have a rehearsed answer to this question. "It was great! I mean, there were definitely some ups and downs, but it was a great semester." And it was. But I elaborate more in my head: There were so many unexpected and utterly fantastic moments. I loved this past spring semester. But then there was that part that just went wrong...Unfortunately, I have a habit of categorizing certain situations like that. They just went wrong. They brought heartache, didn't turn out like I expected, weren't what I wanted or dreamed. I'm not happy with it, so obviously it just went wrong somewhere. But I'm uncomfortably reminded of all those verses that tell us to give thanks and rejoice always. What do we do with them when things "go wrong"? I'm pretty sure that by "always", Paul really meant in hard times because it's easy for a happy person to give thanks. Life is falling into place. Thanks, God!